In a previous post, I described how well I was treated going through Boston's Logan airport security with a disability. Having barely passed their series of security challenges, I was relieved to finally arrive to my gate and see just how secure I was. How naive. I never would've imagined Dunkin' Donuts would be the way in which terrorists would infiltrate our highest levels of security. But they apparently did. After all, the counter was manned by a Somali (practically Iraqi) and every state trooper in the gate was huddled around that counter and weren't moving. I felt like I was Drudge breaking the Monica Lewinsky story. 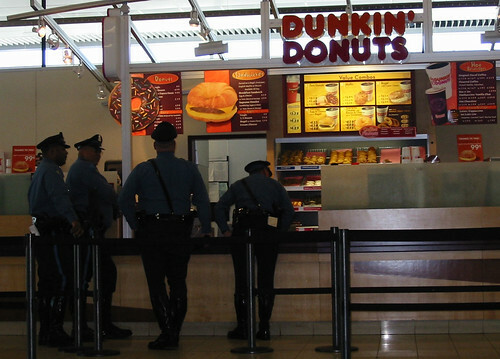 Seeing all these cops meandering about a Dunkin' Donuts was so shocking, I stopped in my tracks, clumsily grabbed for my camera, stood up in the middle of the gate area and snapped 3 images of these guys. Not one flinched. Trying not to arouse suspicion (obviously they had cased this situation for months and were not making any sudden moves) they took their donuts and coffee and went and took a nice long rest in the area beside the donut shop. I could only guess how they were strategizing to put the final moves on those terrorist bastards. I almost wished I missed my flight to see the boys in action.